ON ONE SIDE THERE IS A FALLEN STAR AND ON THE OTHER SIDE THERE IS FOUR WALLS. THE COVER AND THE RECORD ARE IN GOOD CONDITION. SINGLE VINYL RECORD 45. Columbia Records # 31428. "San Antonio Rose". Rare Country 33rpm by. Record Grading Near Mint (NM or M-). If you like 45's. Speed 45 RPM. Record Size 7". 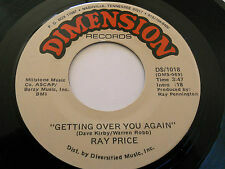 RAY PRICE NM Getting Over You Again 45 Circle Driveway DS-1018 Dimension 7"
Get ting over you again / Circle driveway. If you are a fan of rock and soul LP's and 45's. I have 45's and albums of artists from the '50's, '60's and 70's and 80's for sale. For 45's, Each addl. Also note that my grading standards are stricter than those of many other dealers. I have thirty years of experience as a record collector and dealer. Columbia 42827. After test playing, I will usually mark these as plays clean or plays OK (very acceptable). 5 (VG) Often the most misunderstood and misrepresented grade in the industry. My VG's are clean playing discs. I'M ALONE BECAUSE I LOVE YOU. ONE BROKEN HEART. A record that should play mint but has a few slight visible marks. The center hole will not have been misshapen by repeated play. Many of the defects found in a VG record will be more pronounced in a VG disc. Roger Mill & Willie Nelson (with Ray Price). Hillside Records # 7605. Billy Armstrong. "Billy's Orange Blossom Special". "Tribute To Ray Price". 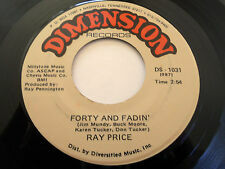 RAY PRICE NM It Don't Hurt Me Half As Bad 45 She's The Right Kind Of A Woman 7"
Genre Country. If you are a fan of rock and soul LP's and 45's. I have 45's and albums of artists from the '50's, '60's and 70's and 80's for sale. For 45's, Each addl. Outside the US, ask and we'll quote you a price. RAY PRICE - DON'T DO THIS TO ME Very rare 1957 Aussie Single Release! Very rare original 1957 Australian RAY PRICE Single Release! 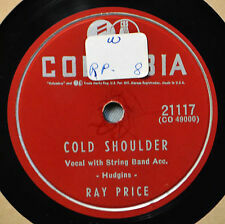 This RAY PRICE Single Rarity rarely ever show up in such really nice Shape! In this still quite highly collectable Condition a Must-Have for any serious RAY PRICE Record Collector! 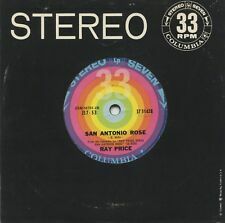 TITLES: "San Antonio Rose". (And NO, NOT LISTED ANYWHERE ELSE!). ARTIST(s): Ray Price. SONG CREDITS: B. Willis. bw "One Fiddle, Two Fiddle". Columbia 35017. Ray Price's "It Should Be Easier Now / Touch My Heart" on Columbia. RAY PRICE "It Should Be Easier Now / Touch My Heart". Genre: Soul. There is a hole through the label which would make it net out to Excellent condition. It is out of print. Catalog # 4-33093. Vinyl is VG. The item pictured is the item for sale. 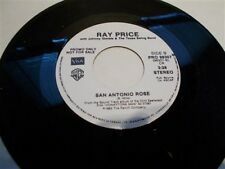 RAY PRICE NM San Antonio Rose 45 One Fiddle Two fiddle 7-29830 Warner Bros. 7"
San antonio ros e / One fiddle two fiddle. Warner Bros. Record Label Warner Bros. If you are a fan of rock and soul LP's and 45's. I have 45's and albums of artists from the '50's, '60's and 70's and 80's for sale. RAY PRICE NM There's Always Me 45 If It's All The Same To You 277 Monument 7"
If you are a fan of rock and soul LP's and 45's. I have 45's and albums of artists from the '50's, '60's and 70's and 80's for sale. For 45's, Each addl. Outside the US, ask and we'll quote you a price. Record Label Step One SOR. If you are a fan of rock and soul LP's and 45's. I have 45's and albums of artists from the '50's, '60's and 70's and 80's for sale. For 45's, Each addl. Outside the US, ask and we'll quote you a price. It is on the Step One Records label, number 381. "With Christmas Near". "For Christmas" /. They always fill in "Good". I only try to describe picture sleeves (if included) as best I can. ALL GRADING IS VISUAL. Record is in Good condition with scratches and scuffs. Scratches and scuffs may affect the play of the record. I cannot feel any of the scratches or scuffs. 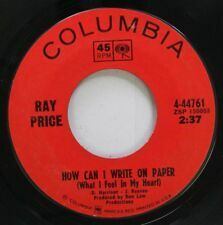 RAY PRICE 7" SINGLE, WASTED WORDS / I,VE GOT A NEW HEARTACHE ( PROMO ). (And NO, NOT LISTED ANYWHERE ELSE!). ARTIST(s): Ray Price. I MAKE NO ATTEMPT TO MAKE MONEY IN THIS AREA ! RAY PRICE - April's fool. US 7" DJ PROMO. This is one of 10000 singles LP's, 12” and 7" that I HAVE COLLECTED OVER THE LAST 30 YEARS; they run from the 1950's to the 2000's and cover every style of music. City Lights / Invitation To The Blues. Promo copy. Vinyl Condition: VG . Cover Condition: VG . 7" Vinyl 45 Record. Format: 7" 45. VG- and below Let's be honest: sound quality is low and the cover may be in very poor shape. Photographs show the WORST side of the label. Grading as follows: Near Mint=Like New or Very Close. VG =Slight Wear/Close to Near Mint. VG =Mild Wear/Nothing Serious. VG=Noticeable Scuffs and/or Scratches but Still Enjoyable. Ray Price "For Christmas/ "With Christmas Near" on Step One Records. US 7" DJ PROMO. RAY PRICE - You wouldn't know love. This is one of 10000 singles LP's, 12” and 7" that I HAVE COLLECTED OVER THE LAST 30 YEARS; they run from the 1950's to the 2000's and cover every style of music. Rates for overseas seem to change often and sporadically depending on country. COVER CONDITION : generic. TITLES: "Roses And Love Songs". ARTIST(s): Ray Price. (And NO, NOT LISTED ANYWHERE ELSE!). bw "The Closest Thing To Love". ARTIST: Ray Price. LABEL: Columbia (3 Records). They will be in VG condition or better. A: Danny Boy. Artist: Ray Price. Catalogue Number: 13-33119. the sound, which is why we play testall of our records. So you know the sound quality of the record you're getting, not just what it looks like. Motorcitymusic 45 rpm Collectibles SEE PHOTO OR ITEM TITLE FOR B-SIDE INFORMATION FOR CONDITION OF RECORD SEE ITEM TITLE A-SIDE/B-SIDE.